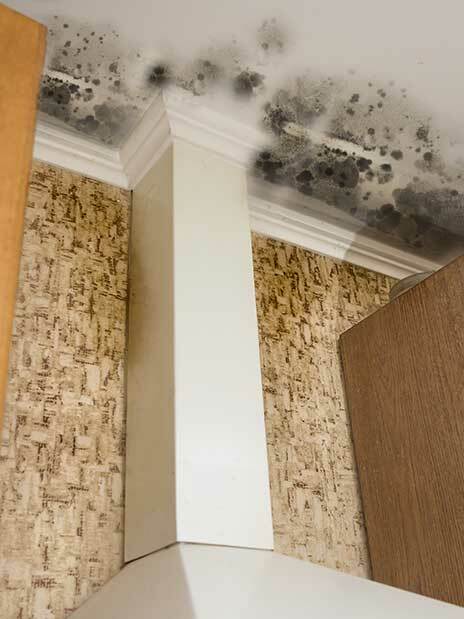 Excess humidity, floods, fire, stagnant water or damp surroundings support the growth of mould spores. Black mould, which is highly toxic, can be found in water-soaked wood, ceiling tiles, wall paneling, cardboard and items made of cotton (upholstery). It also grows on drywall and insulation, and can infest floors, walls and ceilings. Mould is a huge health hazard which aggravates allergies and asthma, as well as causes respiratory dysfunction and flu-like symptoms in healthy people. Odour, discoloration and staining indicate the presence of mould and mildew in your office, factory, warehouse, residential buildings or hospice. Here’s what it looks like to the left. The PH Group offers expert black mould remediation or black mould removal services. Detailed testing, proper sealing of contaminated areas to prevent spreading and efficient removal methods ensure that you are able to deal with this problem permanently and in a cost-effective manner. Call PH Group or fill out our online form to schedule mould removal for your premises in Central Ontario. We have solved recurring mould problems for our customers in all major cities including Barrie, Toronto, Kitchener, Windsor, St. Catherine, Midland and Parry Sound. PH Group will put an end to your mould problems in Central Ontario, including Barrie, Toronto, Kitchener, Windsor, St. Catherines, Midland and Parry Sound. Inferior treatments are a waste of time, effort and money. Not to mention an increased health risk.